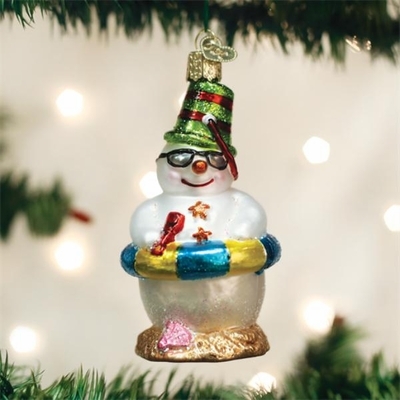 Home > Old World Christmas - Traditional Glass Christmas Ornaments > Old World Christmas Glass Ornament - "Snowman On Beach"
Winter can be filled with cold, blustery and harsh weather. Occasionally, a snowman sneaks away to a hot summer beach, even if only in his imagination. Our friend has gathered his sunglasses, sand toys, floaties and seashells for some fun in the sun!